I haven't seen this mentioned on your blog yet, but I may have just missed it, but I saw the Japanese translation of Coraline in large stacks fairly prominently displayed (not as prominently as the Harry Potter books, alas) in a bookstore here in Yokohama the other day. I think the illustrations are different from the English language versions, though? But, anyway, I just thought I'd let you know. Thanks so much. I expect I'll see a copy soon. There are a couple of countries where the publishers decided that the Dave McKean illustrations were wrong for their people, and Japan was one of them -- although I've not seen what they came up with. Although the UK paperback Coraline, which comes out in September, now has the Dave McKean illustrations added in, and a very strange new cover by Dave,the front of which is very bright and cheerful, and the back cover of which is dark and strange. 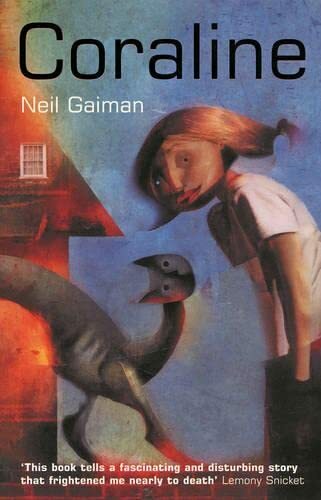 Incidentally, yesterday's post brought the Israeli edition of Coraline -- which does have the Dave McKean cover art and illustration. Regarding those who had to be turned away at last year's Union Square signing - it might not be a bad idea to take a cue from Megatokyo's Fred 'Piro' Gallagher. The panels he does at Otakon tend to be mobbed, and a lot of people just don't get in. So last year they tried something new. There were two panels, one during the day and one at midnight. Anyone who waited on line but didn't get into the daytime panel got a "dead pass" which would let them cut in line for the nighttime panel. According to Piro, it worked quite well. Of course, I don't know how much control you have over where and when you sign, but it's something to think about. Ironically enough, the NYC Borders signing is on the first day of this year's Otakon. I am incredibly sad, as I have gone to every one of your New York book signings (not that you'd remember me, but I certainly remember). This will be the first one I've ever missed (and no, I can't miss the first day of Otakon, as I've already paid and Friday is the entire reason I go to it). I bet I'm not the only one. So if you did another signing, it would be very lovely and make many otaku very happy. But I know better. So perhaps I'll draw you a picture, or write a letter. Tempted to ask for a shout-out at the signing, which seems rather silly now that I've typed it out. But I can't bring myself to delete that last sentence. Well, normally my solution at a store signing is simply to stay until everyone's done. It means you stumble out of the signing at 1:00am every now and again, but there really aren't rainchecks you can hand out on a booksigning tour -- apart from anything else, you'll probably be in Cleveland tomorrow. At San Diego, except for the Sunday afternoon signing (by which time the convention's almost done, and it may not be a problem) I've tried to make it so that the autographings are before the major panels, so nobody has to miss a panel -- or leave half-way through -- in order to stand in line. The prime colors for "The day I swapped my dad" were reds, oranges and yellows. For "the Wolves in the walls" it seems to be Greens and Browns. was this a conscious decision on yours or dave mckean's prt, to play againt the colors for "the day I swapped my dad?"